Geoffrey R. Oxnard, MD, specializes in researching molecular mutations in non–small cell lung cancer (NSCLC) with a particular emphasis on prognostic and predictive biomarkers. 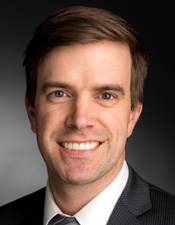 Oxnard, who is an assistant professor of Medicine at Harvard Medical School and a thoracic oncologist at the Dana-Farber Cancer Institute, spoke with Targeted Oncology about the potential for BRAF-targeting therapies in NSCLC. TARGETED ONCOLOGY: What is the potential for utilizing currently available BRAF/MEK-targeted therapies in treating patients with NSCLC? Oxnard: Combination BRAF/MEK inhibitor therapy is a very compelling approach because combinations of BRAF and MEK inhibitors have clearly been shown to improve response rates and overall survival in melanomas harboring BRAF V600E mutations when compared with single-agent BRAF inhibition. A trial of dabrafenib plus trametinib in NSCLC harboring BRAF V600E was recently published, reporting a response rate of 63% (36 patients),1 which is improved as compared with a previously published trial demonstrating a response rate of 33% (78 patients) with single-agent dabrafenib. TARGETED ONCOLOGY: What are the most significant hurdles to targeting BRAF in NSCLC? Oxnard: BRAF V600E and non-V600E mutations are rare in NSCLC; each occur in about 1% to 2% of NSCLC. While this calculates to a few thousand cases annually in the US alone, many of these patients are missed because BRAF genotyping is not routine in all oncology practices. FDA approval of a targeted therapy option for NSCLC harboring BRAF V600E would make BRAF genotyping a standard component of NSCLC care, as is currently the case with EGFR, ALK, and ROS1. However, drug development for these rare NSCLC genotypes can be tricky because randomized trials are infeasible, so regulatory approval must be based upon single-arm trials. This gives me hope that the compelling results with dabrafenib/trametinib, in addition to the established survival improvement in melanoma, could be enough for FDA approval of this regimen for NSCLC. TARGETED ONCOLOGY: What is the profile of a typical patient with BRAF-mutant NSCLC? That is, age, smoking history, other mutations, etc? Oxnard: There is no classic clinical phenotype for BRAF mutations in lung cancer as there is for some other oncogenic drivers, except that they are mostly found in adenocarcinoma rather than squamous carcinoma. These are found both in patients with no smoking history and in patients with a heavy smoking history. In one recent analysis we found that the incidence of BRAF V600E mutations increases with older age3, contrasting with other targetable genotypes in NSCLC which seem to be enriched in younger patients. TARGETED ONCOLOGY: How do BRAF mutations impact prognosis or response to therapy in NSCLC? Oxnard: There are two classes of BRAF mutation in NSCLC: V600E and non-V600E. BRAF V600E mutations are generally nonoverlapping with other NSCLC genotypes, and these can be sensitive to targeted therapy with BRAF inhibitors. Non- V600E mutations can co-occur with other NSCLC genotypes and, to date, have not been demonstrated to be sensitive to targeted therapies. TARGETED ONCOLOGY: How do BRAF mutations in NSCLC compare with those in other tumor types? Oxnard: We know that the BRAF V600E mutations in melanoma are associated with dramatic response to BRAF inhibitors, with response rates in the range of 50%. However, this drug sensitivity has not been seen in colon cancer, where response rates to BRAF inhibitors are in the range of 5%. In NSCLC, the results seem to be more like melanoma, though outcomes aren’t quite as good: response rates are in the range of 30% to 40% to single-agent BRAF inhibition. Planchard D, Besse B, Groen HJ, et al. Dabrafenib plus trametinib in patients with previously treated BRAFV600E-mutant metastatic non-small cell lung cancer: an open-label, multicentre phase 2 trial [published online June 6, 2016]. Lancet Oncol. doi:10.1016/S1470- 2045(16)30146. Oxnard GR, Wilcox KH, Gonen M, et al. Response rate as a regulatory end point in single-arm studies of advanced solid tumors. JAMA Oncol. 2016;2(6):772-779. Sacher AG, Dahlberg SE, Heng J, et al. Association between younger age and targetable genomic alterations and prognosis in non-small-cell lung cancer. JAMA Oncol. 2016;2(3):313-320.